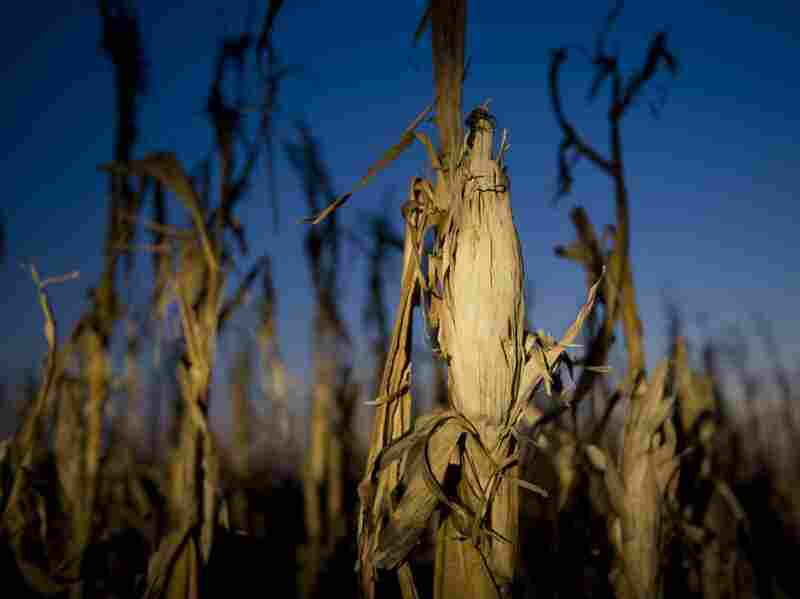 In Drought, Should Corn Be Food Or Fuel? Drought across the country has led to spiking corn prices, forcing a growing number of ethanol plants around the country to temporarily close down. As a result, there is a growing call for suspending a federal mandate on biofuel and freeing up corn for feed. Drought has taken a toll on corn this year, and as a result, a growing number of ethanol plants have closed. Standing outside the Central Minnesota Ethanol Co-Op in Little Falls, Minn., there's not a lot going on. The pungent smell of fermentation that typically hangs in the air here is absent. And trucks piled high with corn are nowhere to be seen. They're idled in part because of high corn prices. And it's unclear when that will change. "Most of the industry is just breaking even in terms of profitability or actually running at slightly negative margins," says Geoff Cooper, vice president of research and analysis at the Renewable Fuels Association. Cooper says since the start of the summer at least seven ethanol plants are now idle in states like Nebraska, Minnesota, Indiana and Kansas. Including shutdowns from past years, Cooper says about 10 percent of the nation's ethanol plants are now offline. Others, though still operating, are running at 75 percent or 80 percent of capacity. The nation's corn crop won't meet expectations. Some predict it will be only two-thirds of what was planted in the spring. Stacey Hudson, senior research associate at the financial services firm Raymond James & Associates, says many ethanol producers are sandwiched between rising corn prices and marginally profitable fuel prices. "With corn at about $8 a bushel these ethanol producers are looking at cash margins of about 8 cents per gallon, which is pretty weak," she says. High corn prices and limited supply have renewed the debate over whether this crop should be going to produce fuel or food. This year the federal government says producers should make 13.2 billion gallons of biofuel. Most of that comes from corn. In a series of letters this month, governors and members of Congress petitioned the Environmental Protection Agency to suspend or lower what's called the Renewable Fuel Standard to ease costs for agriculture and food producers. Jason Hill is a professor of bioproducts and biosystems engineering at the University of Minnesota. He says while roughly half of nation's corn supply this year will go to producing ethanol, that ethanol will make up only between 5 and 6 percent of the nation's fuel consumption. "So [it has a] very large impact on our corn market, a very small impact on our fuel market," he says. Many farmers are having a difficult time affording the feed for their livestock. Earlier this month, President Obama announced the government would buy up to $170 million in surplus meat as many producers are being forced to sell off their herds to the slaughterhouse. At the Centra Sota feed co-op in Little Falls, the impact of the drought and ethanol plant shutdown is mixed. The company sells feed for dairy cattle, chickens and other livestock. Manager Lon Johnson says the price of a 50-pound bag of cattle feed is up from $13 last year to nearly $17 this year. "This already reflects the high prices. Everything's been kind of going up," Johnson says. Well, not everything. Since the ethanol plant shut down, the price Johnson is paying for corn has dropped by 15 to 20 cents per bushel. But he says it ends up being a wash. Sitting in his office, Johnson say he uses a byproduct from the ethanol plant for feed. Now instead of going down the road, Johnson has to drive 80 miles to the next plant to get the partially used corn he mixes into feed. "It doesn't make it any easier for us because maybe we can buy our corn 20 cents a bushel cheaper, but it costs me 20 bucks more because we bought corn distillers from the ethanol plant. That's one of the things people a lot of times keep forgetting with an ethanol plant. Even though they're using a lot of corn, they're still putting a lot of feed back into the market," he says. "Food versus fuel? I think we need 'em both." The Renewable Fuels Association expects more plants to go offline this year if corn prices stay high and ethanol prices remain relatively low. For now, those tied ever so closely to corn are anxiously awaiting the fall harvest to inject some certainly into their business plan.